absolutely packed with supporters at the Private View yesterday. The Gallery was filled from end to end for the speeches and the awards. There area number of events during the course of the exhibition. 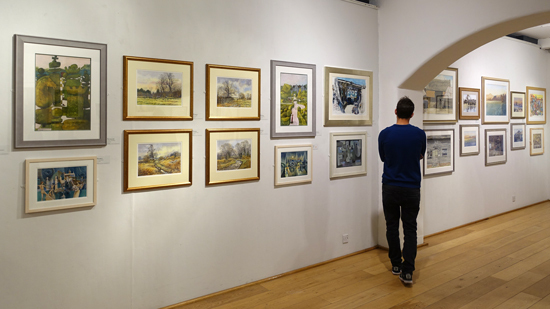 You can find a complete listing of events on the Mall Galleries website. You can also see the listing all on page 4 of the catalogue - see the link at the top of the page. Also at the end are details of two more exhibitions by the RI in West Sussex and Cardiff if you're unable to get to this one. Below you'll find my review of the exhibition in general. show you the work of some of the candidates for membership - with images of the excellent candidates' wall and some of the candidates. But first here are the exhibition metrics for all those artists considering entering this competition. 142 artworks (36%) by 98 non-members. This is a MAJOR improvement on the 25% of works from the open selected for exhibition in 2015. The ratio of members' to open artworks hung is 64:36. This is an acceptable ratio for an open exhibition - with scope to improve still further. The open entry brought 1,090 entries from 489 artists. 142 artworks by 98 members were selected and hung in the exhibition. the average number of artworks hung per artist is 1.44 - even successful artists don't get all their artwork selected for hanging! 20% of artists were successful in getting their art hung. This is a good percentage compared to many major art competitions. It also means that a number of those who were successful probably only submitted one "best work". 'Open' artists: averaged 1.45 works hung each. It's too early to say anything yet about sales but I may well be back and if I am I will do a count! The exhibition is back in three galleries for the first time in a long time - and looks and feels all the better for it. The West Gallery is mixed with predominantly members work on display. 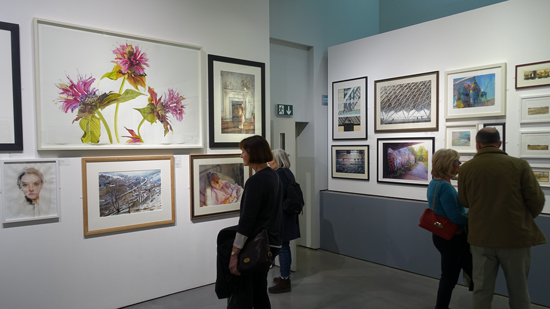 Two of the North Galleries are mixed with predominantly the artwork selected via the open submission alongside some displays by RI members. 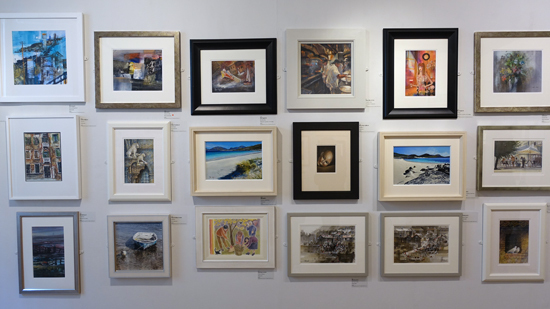 The far North Gallery contains small works by RI members. This has become a popular room in recent times. The Threadneedle Space has a Candidates Wall - for those seeking full membership of the RI. 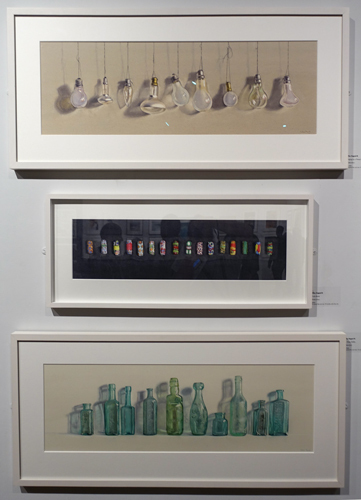 Plus artworks by artists under the age of 30 who are eligible for The Leathersellers' Prize - of which more tomorrow. The artwork in the room is predominantly by artists selected via the open. I was very impressed by the standard of the open work. 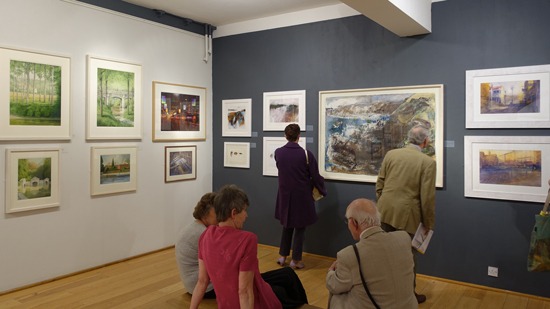 The exhibition had a very fresh feel about it - bringing some new perspectives on how watercolour can be used. The President emphasised that the selection panel had deliberated at length over the digital images submitted when making the selection. I liked the very much better balance between members and those selected via the open both in terms of numbers and the mix re. the hang. I looked around the gallery as the PV wound its way to the end - and realised that this was an exhibition which has responded well to my various injunctions over the years on how to frame for London - and sell a painting! (eg. see Do frames help to sell art?) The frames on the artwork are almost universally simple in terms of moulding and colour - they're either white, black, neutral or pale wood. There are just a very few metallic looking frames which I confess now tend to look rather old-fashioned to my eyes. it was good to see some plants and flowers creeping into the exhibition. I have not a clue why some of the best watercolour painters I know - the botanical artists working in watercolour - do not typically submit their work to the open exhibitions of the two watercolour societies. It was really great to see lots of paintings look like they were painted with water! Ones where you could actually see the use of "proper watercolour techniques"! This is no small achievement in an era when acrylic seems to have taken over! Lots of individual paintings! It's difficult to single out however, artists whose work appealed this year (who I'm not discussing elsewhere!) 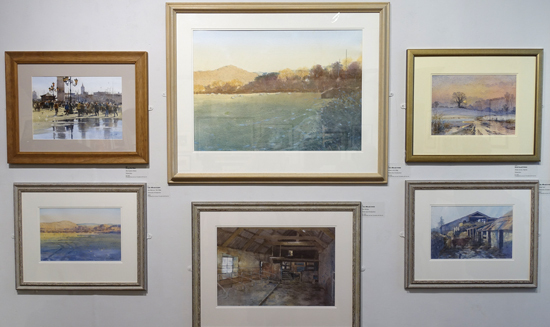 are the 'same but different' collections of Lilias August, the unassuming paintings of the countryside by Colin Allbrook which has amazing control over colour and luminescent light, and how can you not like the work of John Yardley - who to my mind is the consummate "one hit and that's it" watercolour painter! His painting of Venice in the snow was superb! PLUS Meeting new artists, old friends and artists whose work I've previously commented on - plus readers of this blog! There were a couple of hours where all I did was meet people! I also don't think I've ever had an exhibition before where quite so many people came up to me and thanked me for this blog! I'm very happy to know that you like its content and the fact I'm honest about how I see things. I suggested that maybe the RI might also like to become interested in what watercolour looks like on vellum! Just a thought - it's very traditional and contemporary at the same time! Tomorrow - more about the Award Winners and Candidates. 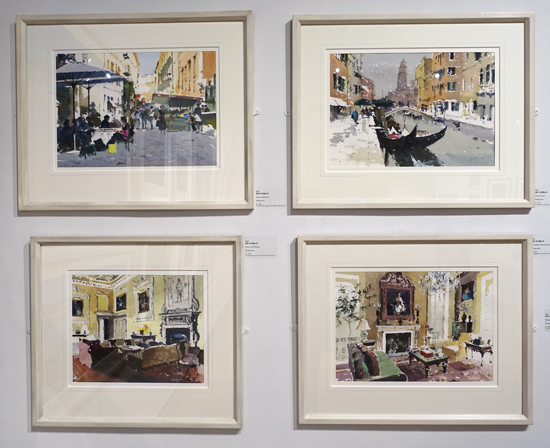 Annual Exhibition of Royal Institute of ... 26 Mar 2015 - Review of statistics for the open entry to the 203rd Annual Exhibition of Royal Institute of Painters in Water Colours and paintings I liked.